This Great War map was prepared by the County Chief Constable’s Office, St. Mary’s Gate, Derby in January 1916. It depicts the planned routes of movement of ‘refugees’ from eastern England for the sanctuary of Derbyshire in the event of a hostile landing on the Lincolnshire coast. Eight planned evacuation routes, each following the network of minor roads and byways (main roads and railways were to be strictly off-limits to civilians in the event of an invasion), are labelled to the right of the map (Route Nos. 1–8). These routes are shown against a backdrop of administrative units (Petty Sessional Divisions) around which local emergency committees – responsible for the development and implementation of local evacuation plans – were organised. …although the county was situated remote from the seaboard it could not remain indifferent to the possibility (to place it no higher) of an invasion. (Hear, hear). The problem which would have to be faced in such an event, was different from that which would be presented in those with a coast line, but it was a problem nevertheless. If there was any big movement of population from the coast, they [Derbyshire] would have to deal with it, and there were also the matters of the disturbance of traffic on the railways … and the keeping of the roads clear (The Derbyshire Courier, 1914, p. 1). The same meeting passed a resolution for the formation of a Derbyshire volunteer corps for home defence. When called upon, members of the corps would render service at the county border by leading evacuees down bye-lanes and across fields – thereby keeping the main roads and railways clear for the free passage of the military – and to guide the evacuees to their lodgings (The Derbyshire Courier, 1914, 1915). By the spring of 1915, the military situation had begun to stabilise. 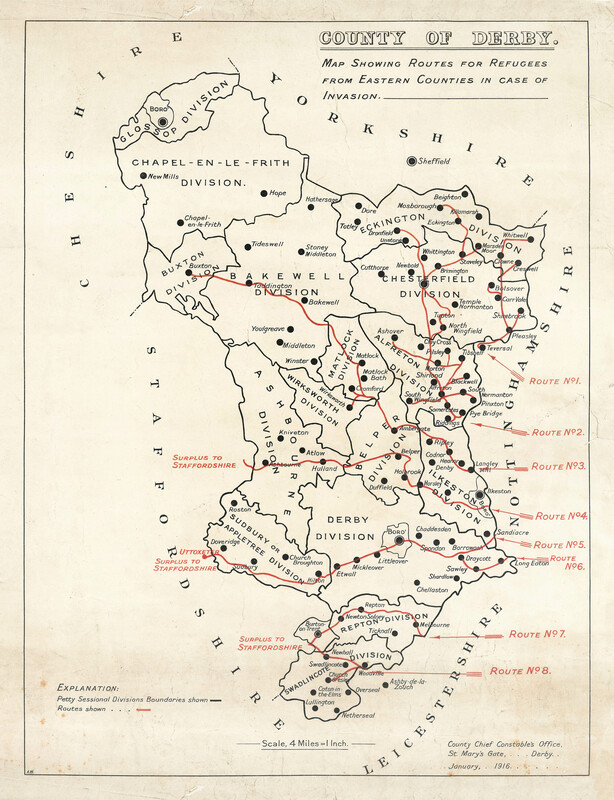 Following a reorganisation of home defence, the first of several national inter-service (Admiralty and Army) conferences on invasion was held in January 1916 – the month to which the map relates. The conference concluded that a German invasion force of up to 160,000 could appear anywhere between the Wash and Dover without warning (Moon, 1968). The identification of the Wash as the most northerly point for a large-scale invasion on the Lincolnshire coast had no doubt informed the planning of the mapped evacuation routes; back-projection of the vectors running through Nottinghamshire and Leicestershire identifies a convergence point on the Lincolnshire town of Boston and the area of South Holland, adjacent to the Wash. But where were the evacuees to be lodged once they had reached Derbyshire? Reports in the local press point to the intended use of private residences in the first instance. In mid-February 1916, the Ripley and Heanor News reported that a canvass had been made of householders willing to accommodate evacuees in the Ripley district, situated on evacuation Route No. 3. “There is not the slightest necessity for any person to become nervous” the report stated reassuringly; “the canvass is merely a precaution against the possible but improbable” (Ripley and Heanor News, 1916, p. 2). Further to the south, on evacuation Route No. 7, a similar canvass of the residents of Melbourne and district was taken at about the same time (The Derbyshire Advertiser, 1916a). Alongside private residences in these and other districts, council and church schools were also secured for the purposes of billeting (The Derbyshire Advertiser, 1916b). Even then, the sufficiency of accommodation along some of the evacuation routes was uncertain as evidenced by the contingency (“surplus to Staffordshire”) at the western end of Route Nos. 4–8. The authorities were acutely aware of the public disorder and panic that could accompany an invasion (Mitchinson, 2005; Pennell, 2008). As if to quell any such panic, the map instils a reassuring sense of planning, order and control in the evacuation process. In the event, of course, the Derbyshire evacuation scheme was never realised. 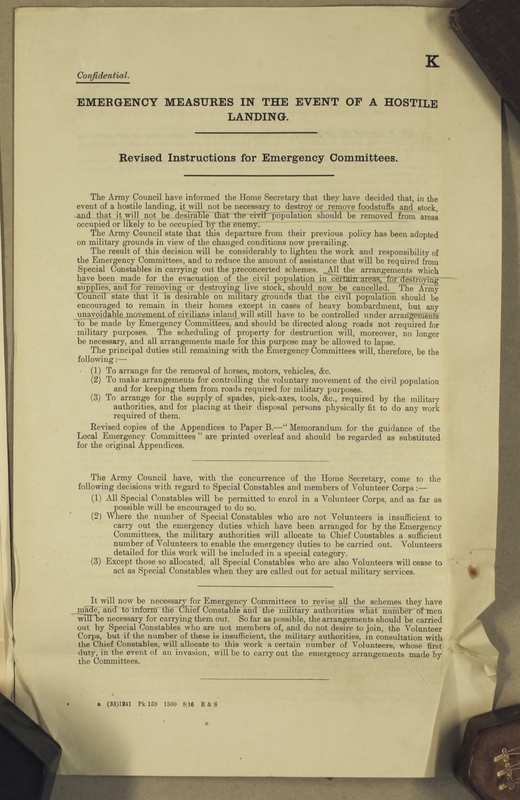 Under revised instructions dated 16 August 1916, the Home Office cancelled all plans for civilian evacuation; civil populations were to be encouraged to remain, wherever possible, in their homes in the event of an enemy invasion. This departure from previous policy came on the command of the Army Council and, apparently, reflected the prevailing military conditions of the time (Home Office, 1916). Map of Derbyshire, showing the planned routes for the movement of evacuees (referred to in the map title as ‘refugees’) from Lincolnshire in the event of a German invasion of eastern England in the Great War. The map was prepared by the County Chief Constable’s Office, St. Mary’s Gate, Derby and is dated January 1916. Scale: 1 inch to 4 miles (1:253,440). Dimensions: 368 × 490 mm. Paper on cloth. Source: map collection (item ref. B92B), School of Geography, University of Nottingham. Home Office (1916). Emergency Measures in the Event of a Hostile Landing. Revised Instructions for Emergency Committees. a (33)1241 Pk 159 1500 8/16 E&S. Reproduced in http://www.henhamhistory.org/HenhamImages/ww1%20evacuation/SEAX%20docs/evac%2014.jpg (last viewed 03/01/19). Mitchinson, K.W. (2005). Defending Albion: Britain’s Home Army 1908–1919. Basingstoke: Palgrave Macmillan. Moon, R. (1968). The Invasion of the United Kingdom: Public Controversy and Official Planning, 1888–1918. Unpublished PhD thesis, King’s College, University of London. Pennell, C. (2008). ‘“The Germans have landed!” Invasion fears in the south-east of England, August to December 1914.’ in H. Jones, J. O’Brien, C. Schmidt-Supprian eds., Untold War: New Perspectives in First World War Studies. Leiden: Brill, 95–116. Ripley and Heanor News (1916). ‘Notes.’ 18th February, 2. The Derbyshire Advertiser (1916a). ‘Melbourne.’ 12th February, 10. The Derbyshire Advertiser (1916b). ‘Derbyshire Education Committee.’ 31st March, 4. The Derbyshire Courier (1914). ‘Preparing for invasion. Derbyshire’s plan against a raid.’ 26th December, 1. The Derbyshire Courier (1915). ‘Chesterfield’s new Home Guards. Unanimous town’s meeting. What to do and how to do it. Colonel Brooke-Taylor explains.’ 23rd January, 1.